Bandai’s latest Star Wars release is a pair of palm-sized mini kits which offer endless diorama possibilities. 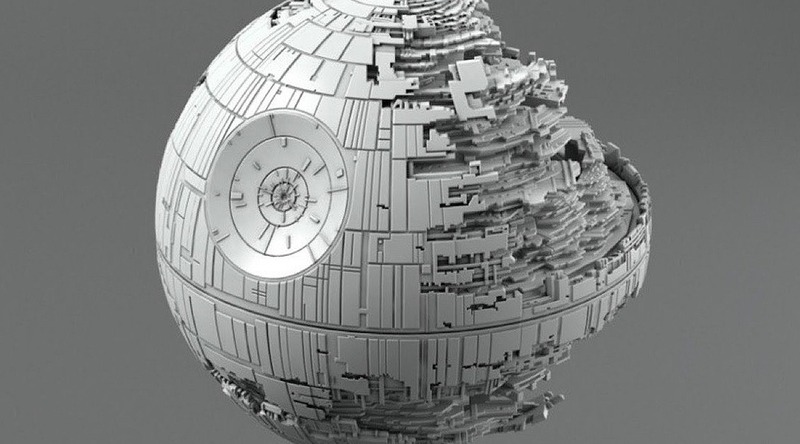 The second Death Star, even more menacing than the first, is scaled down to 1:2,700,000. The Empire’s might in the palm of your hand! Accompanied by a Star Destroyer in 1:14,500 scale. I’m hoping that the Death Star II is in fact a kit with a good number of parts rather than a one-piece casting. This would make lighting it much easier. We’re so accustomed to seeing the Death Star lit up with thousands of internal lights, that an unlit version might come across as rather lifeless. Even adding a few dozen lights to the model would make a big difference. The ideal design for a kit of this type would be a thin outer shell which can be easily drilled to accommodate fiber optics. The same is true for the Star Destroyer. The challenge in both cases will be to find enough room for all the electronics. Diorama possibilities range from a simple scene of the Death Star II in space to a full blown recreation of the Battle of Endor. And because these are mini kits, you won’t need your entire living room to display the finished piece! Finally, a diorama kit of the climactic trench run scene from Star Wars IV: A New Hope. 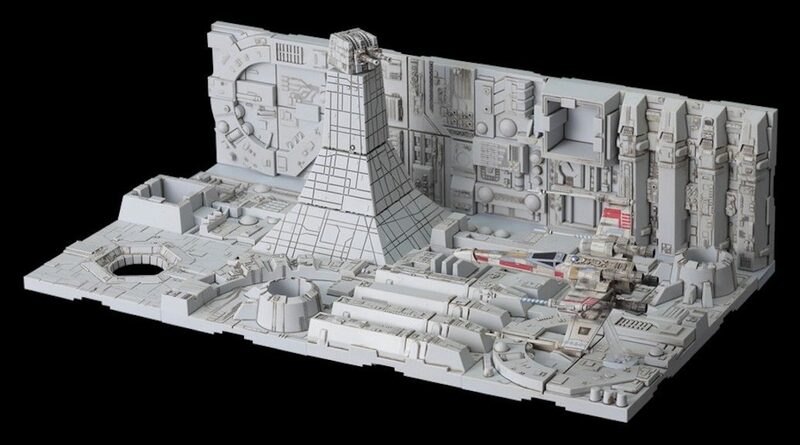 Modellers have been scratchbuilding dioramas of this scene for years, using Death Star tiles (resin castings depicting segments of the Death Star surface) from garage kit producers. But this is the first mass produced injection kit of the subject to come to market. Bandai’s timing is quite leisurely: it’s been 41 years since the release of the groundbreaking film that started the famous sci-fi franchise. To keep things to a manageable size, Bandai has rendered this kit in 1:144 scale. 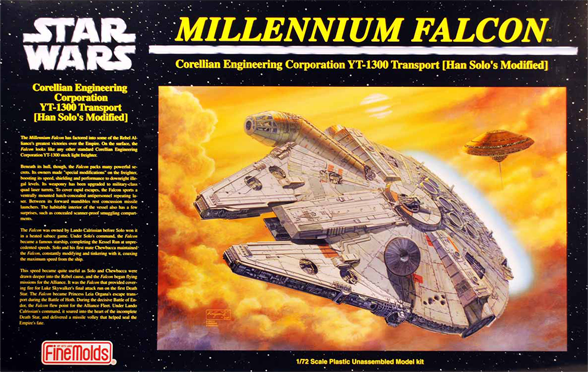 There have been several releases of 1:144 Star Wars vehicles in the last year or two, and if you were wondering why anyone would need a 1:144 X-Wing when it’s already quite compact in 1:72 scale, here’s the answer. The attack on the Death Star was the pièce de résistance of John Dykstra’s revolutionary special effects sequences which helped make A New Hope a cinematic milestone. This scene showcased the capabilities of the new Dykstraflex computer controlled technology to its fullest, making a lasting impression on sci-fi fans everywhere. So brilliant was the trench run scene that it’s been copied a number of times, both within the Star Wars franchise as well as in other films. Since this kit is coming from Bandai, modellers can rest assured that it will meet the highest standards in terms of accuracy and fit. It will likely be engineered to go together quickly and easily, requiring no advanced modelling skills. The design is well thought out, with a laser cannon tower balancing the X-Wing on the opposite end. The diorama will be small enough to fit on just about any bookshelf. The only shortcoming of the kit, based on the initial publicity photos, is the visually clumsy support post for the X-Wing. Supporting a flying vehicle with a plastic post puts a dent in the overall realism of the scene. With a few modifications, the vehicles could be hung from wires for a cleaner look. For Star Wars modellers who haven’t yet ventured into the world of dioramas, this kit is the perfect opportunity to make a go of it. The Jedi Starfighter is Obi Wan Kenobi’s personal hot rod, a sleek delta wing fighter featured in Episode II of Star Wars: Attack of the Clones. 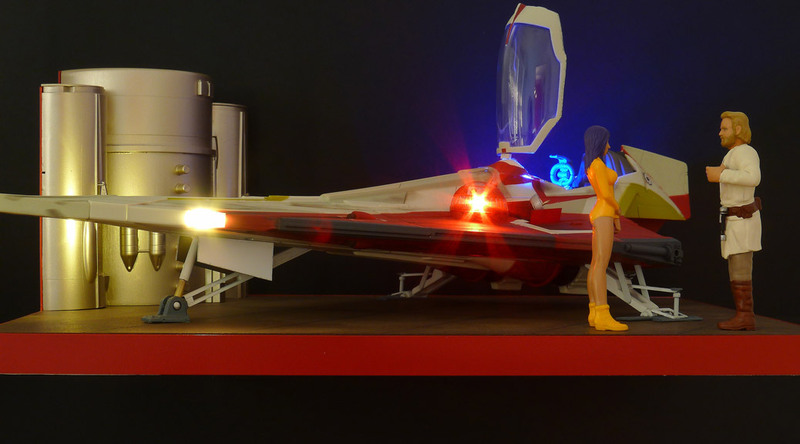 A reworked Hasbro toy with custom LED lighting, scratch built landing gear and a new paint job, the Starfighter is ready to transport Obi Wan to his next daring mission (just as soon as he’s finished his coffee).